When visitors flock to some of America’s most iconic historic venues this summer, they’ll learn much about our nation’s history but also have the opportunity debunk the many legends and myths about chocolate. For example, did you know that cacao beans were used as form of currency dating back to the Aztec Empire, Christopher Columbus discovered America AND chocolate, bringing cacao beans back to the Spanish court in the early 1500s, George Washington drank “chocolate cream” at breakfast, Benjamin Franklin sold chocolate in his print shop, or chocolate has traditionally been included in military provisions throughout history? 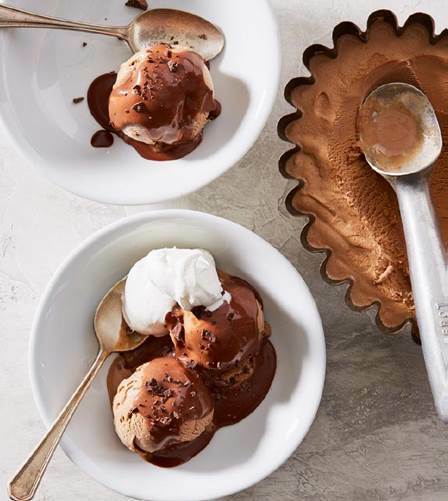 This gem from the book Dining at Monticello may be the oldest American recipe for chocolate ice cream in print. Guests to Thomas Jefferson’s White House reported our third president enjoyed ending meals with a creamy dish of ice cream. The recipe will make approximately 6 servings. 1. Finely grate AMERICAN HERITAGE® Chocolate Block onto a sheet of wax paper. Stir together the milk, cream and vanilla bean in a heavy-bottomed saucepan. Bring to a simmer over medium heat, stirring frequently. 2. Add the sugar and a small pinch of salt, stirring until dissolved. Gradually pour in the grated chocolate, stirring constantly, and continue stirring until completely melted. 3. Whisk the egg yolks in a medium bowl until smooth. Gradually beat in about 1 cup of the hot chocolate milk and slowly stir the egg yolks back into the simmering liquid. Cook, stirring constantly, until the custard is thickened enough to coat the back of the spoon. Remove from the heat and stir until slightly cooled, about 5 minutes. Remove the vanilla bean (it can be rinsed, dried and re-used). 4. Freeze in an ice-cream machine according to the manufacturer’s instructions until set but still a little soft. Scoop into a 3-quart mold, or several smaller molds, running the spatula through the ice cream and tapping the mold firmly to remove any air bubbles. Fill the molds completely. Cover and freeze until set, about 2 to 4 hours. The ice cream may also be set without molding it: scoop it into a freezer-safe container and freeze until set. 5. To serve molded ice cream, dip the mold briefly in hot water, or wrap briefly in a towel heated in a clothes dryer. Run a knife around the top edge to loosen the ice cream from the mold. Invert the mold over a serving dish and gently lift the mold from the ice cream. If not molded, serve in small scoops. Recipe is courtesy of: AMERICAN HERITAGE Chocolate is an authentic historic chocolate made from ingredients available in the 18th Century. The recipe repre­sents a true taste of chocolate the way our ancestors would have enjoyed it. Made with all-natural ingredients and no preservatives, AMERICAN HERITAGE® Chocolate comes in four unique formats: chocolate sticks, chocolate bites, chocolate baking/grating blocks, and finely grated chocolate drink mix. THis is a very custard like ice cream. I think I would have loved to have even more chocolate in it.